Just over a week ago, I finished my month's work experience at Red Hat UK, and I'm pleased to say it went well. I learnt lots about how Red Hat works, dived into the kernel for the first time (and worked on some kernel patches! ), got an RHCT qualification, and generally had a good time with our resident frockney. Hopefully he's managed to clean his house up sufficiently after my departure. The reason for leaving Red Hat mid-week is so that I could go to Bloodstock! It was a brilliant weekend, with the highlights being Die Apokalyptischen Reiter, Saxon, Satyricon, Turisas and Amon Amarth. Photos are up on PicasaWeb. While sorting out the photos of Bloodstock, I also went through all the photos I took while in Gran Canaria for GCDS, so they're also now up on PicasaWeb. This entry was posted in General and tagged Bloodstock Open Air, GCDS, Red Hat on August 20, 2009 by Philip Withnall. With GCDS winding down on Friday, I made my way home on Saturday (again, courtesy of those nice people at the GNOME Foundation), and got back sometime late in the evening, thankfully without Iberia-caused delays. The conference was good, and it was great to meet more of those interesting people from all over the planet. I even managed to get some work done, with Thibault Saunier's Google Documents branch for libgdata landing in master sometime in the next few days. Next up: four weeks of work experience at Red Hat UK. I'm currently occupying some stranger's house in a foreign part of the country, ready for my first day in Farnborough tomorrow. Should be fun. This entry was posted in General, GNOME and tagged GCDS, Red Hat on July 12, 2009 by Philip Withnall. The truth is, there are too many people to name (and listing more would just destroy the joke). The conference is going great, apart from a minor incident with some snails, and I've enjoyed the talks I've been to so far. Somehow, miraculously, my lightning talk on libgdata (slides) went OK (as far as I was concerned), and it even resulted in someone coming and talking to me about libgdata. How brilliant is that? Still, my littlebig library pales in comparison to some of the interesting things which are being shown off at GCDS. Here's to GNOME 3.0! This entry was posted in GNOME and tagged GCDS, GUADEC, libgdata, snails on July 5, 2009 by Philip Withnall. Here I am, somehow successfully arrived in Gran Canaria, despite Iberia's best efforts. My first plane was delayed not quite long enough to give me hope that I'd catch my connection, but just too long for me to do so comfortably. Thankfully, the second plane was also delayed, so my running down the entire length of Madrid's Terminal 4 was somewhat unnecessary. 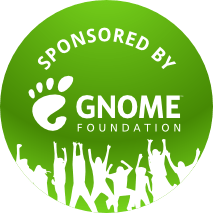 A GNOME Foundation sponsorship badge. How am I here? I'm only here because of the nice people at the GNOME Foundation, who decided to sponsor me. Thank you, nice people! This entry was posted in GNOME and tagged GCDS, GNOME on July 4, 2009 by Philip Withnall. With my exams now finished (all 19 hours of them), it's time to look forward to GCDS 2009. In a fit of madness, I signed up to do a lightning talk on "libgdata and web integration", which will take place in the Synphonic Hall sometime between 15:30 and 16:30 on Saturday. If anyone wants a laugh at my expense, please turn up. I was wondering if anyone attending GCDS was planning on going hiking in the mountains of Gran Canaria. To me, that would be more appealing than the arranged tourist outing, and some company would be welcome. I was thinking the Thursday would be most suitable, but I don't have any plans at this stage. This entry was posted in General, GNOME and tagged exams, GCDS, GUADEC, hiking, libgdata on June 26, 2009 by Philip Withnall.